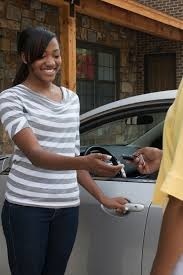 If you are considering purchasing a new or used car for a teenager in your life, there are many issues to ponder. Whether you are paying for the car, its upkeep and insurance, or just giving advice to a young person, your input as an experienced driver and vehicle owner matters. Safety: Don’t scrimp on safety components. If you can afford camera-assisted parking, go for it. OnStar is a wonderful resource for teen drivers as it gives them a feeling of safety and security that they won’t be abandoned or lost. Be sure all safety equipment is in tip top shape, like airbags, seatbelts, brake systems and tires and their components. Size: Teens are relatively inexperienced drivers. As a result, they need a vehicle that is just right: not too big and not too small. New drivers are safest in mid-size vehicles, so avoid a small sports car or Smart car as they have higher injury and fatality rates in collisions. On the other hand, a large pickup truck or SUV is not the best choice for a 16 or 17 year-old, who may not have the ability to handle these bigger vehicles in all situations. In Michigan, 16 year-olds are limited as to how many passengers they can transport, but those limitations end at 17. In order to keep the number of passengers down and therefore reduce distractions inside the car, eliminating a third row of seating is a great idea, which nixes minivans and SUV’s. Car purchases are expensive decisions. It is important to really consider the specific needs of teens when embarking on this exciting, but potentially dangerous, rite of passage.